The president of Chad said Saturday that oil companies Chevron Corp. and Petronas must leave the country, adding that neither had paid taxes. In remarks on state-run radio, President Idriss Deby gave the companies, which have been part of the African country's oil production consortium that is led by Exxon Mobil, a deadline of just 24 hours to start making plans to leave. "Chad has decided that as of tomorrow (Sunday) Chevron and Petronas must leave Chad because they have refused to pay their taxes," Deby said in a message broadcast on state-run radio. Deby said that the country, which is in the midst of setting up a national oil company, would take responsibility for the oil fields that the American and Malaysian companies have overseen, which accounts for some 60 percent of the country's oil production. Sabri Syed, a spokesman for Kuala Lumpur-based Petroliam Nasional Berhad, said he could not immediately comment on Derby's announcement. A message left seeking comment with San Ramon, California-based Chevron was not immediately returned. The production and export of petroleum in Chad are overseen by the Exxon Mobil-led consortium. Under the mechanism, Texas-based Exxon Mobil Corp. is responsible for 40 percent of the country's production, while Chevron and Petronas each have 30 percent. The three companies agreed to finance a risky US$4.2 billion 1,060-kilometer pipeline to deliver oil from landlocked Chad to the Atlantic port of Kribi in Cameroon. The companies agreed to invest the money after the World Bank gave the project its blessing and after Chad passed a World Bank-backed oil revenues law that required most of the money to be allocated to health, education and infrastructure projects. 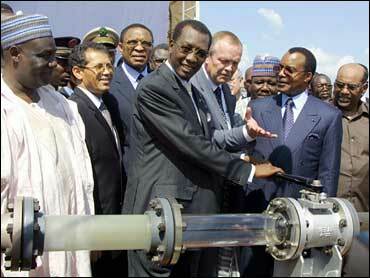 From October 2003 to December 2005, the consortium exported some 133 million barrels of oil from Chad, according to information compiled by the World Bank. Chad itself earned US$307 million, or about 12.5 percent, on each barrel exported. But the venture has proved troubling for Chad, at times. In January, the World Bank froze US$125 million in oil revenue and cut US$124 million in financial aid, accusing Chad of reneging on a promise to set aside part of its oil revenues to help the poor. Last month, the government reached a deal with the bank and signed an accord to commit 70 percent of its budget to poverty and development programs. But the World Bank also agreed to allow 30 percent of oil revenues to go toward Chad's general treasury, instead of just 15 percent. Chad can use that money on whatever it wants — including weapons. Derby's declaration comes a day after he urged his citizens to take a more active role in the production of oil. On Friday Chad government spokesman Hourmadji Moussa Doumgor told reporters that Derby wanted greater profits from oil production. Deby has stressed that the country "should fully enjoy its oil, mining and other resources," Doumgor said. Chad, one of Africa's newest oil producers and not an OPEC member, has struggled with discontent over its poor economy, and unhappiness has intensified over the failure of an immediate boost from its oil field, which went online for development in 2003. Unrest also has spilled over from Darfur, where Sudan's Arab-dominated government is accused of encouraging a campaign of destruction aimed at civilians in African farming villages that are the base for a three-year-old rebellion. Sudan charges that Chad supports the Darfur rebels. Chad, in turn, accuses Sudan of backing eastern Chad rebels. If the two companies are evicted, Chad could turn to China for help, which has taken an active interest in Africa. Earlier this year, Chad broke off diplomatic relations with Taiwan and turned instead to China, a move that could help it sell its oil to the energy-hungry power. China is already the largest exporter of oil from Angola and it also exports oil from Sudan. The country has turned to Africa in search of raw materials such as oil and metals.